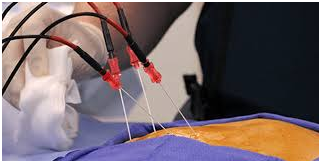 Radiofrequency Ablation is a procedure in which radiofrequency waves are used. With the usage of radiofrequency, waves produce heat on recognized nerves. Specific area of nerves which need to be ablated are confirmed by diagnostic block which takes place before the procedure. By generating heat on the painful nerve, which transmits pain, signals to the brain are destroyed, hence ablating the nerve. It is able to provide the lasting remedy for patients with chronic pain, especially within the lower back, neck and arthritic joints. • Patient experiences pain alleviation after the diagnostic nerve/pain block injection. • Pain relief may last from 6 months to more than 2 years. • The procedure can be repeated. How is a Radiofrequency Ablation actually performs? The patient lies on the X-Ray table, the doctor applies local anesthesia to numb the treatment area, in this procedure patient may feel a little discomfort. A patient may give feedback to the physician as he remains awake. Technique which uses for nerve ablation and for diagnostic blocks are similar. With the usage of a fluoroscope (a special X-Ray) best spine doctor in Ahmedabad applies a thin needle at the place which is the reason for pain. Little discomfort may occur. Once the needle placed, the patient receives numbing medication. Radio frequency current is passed through the needle, it creates lesion which is a small and precise burn. This current destroys that specific nerve portion which transmits pain producing signal to the brain. Lesion takes almost 90 seconds for every side and multiple nerves can be ablated together. What should i expect after Radiofrequency Ablation? Most of the patients can walk immediately after the procedure. After some observation, the patient may be discharged from the hospital. Patients are usually back to work in 24 to 72 hrs. After the Radiofrequency Ablation procedure, pain relief may be experienced immediately or some patients may experience within 10days to three weeks. It is advised to follow up the appointment with physician, so that procedure efficiency could be documented and future treatment requirement could be understood. Although Radiofrequency Ablation is considered a no risk procedure but even for safety purpose, doctors do not recommend Radiofrequency Ablation who have or can have allergic reactions with during procedure medicines. Patients who are prone to bleeding, infection should avoid this procedure.